Audit security of your wireless network by running a high-profile timed attack. Use dedicated or generic Wi-Fi adapters to sniff wireless traffic and break WPA/WPA2 passwords. Supports: WPA and WPA2-PSK passwords, AirPCap and generic Wi-Fi adapters, GPU acceleration with consumer video cards. ElcomSoft has pioneered many software innovations that have made it easier to recover passwords protecting various types of resources. For the first time in the industry, the company’s patented GPU acceleration makes its way into Wi-Fi password recovery, reducing the time required to recover Wi-Fi passwords up to a hundred times. Supporting up to four mixed NVIDIA and AMD video cards, Elcomsoft Wireless Security Auditor allows building servers with supercomputer performance at a fraction of the price. You can use Elcomsoft Distributed Password Recovery to perform a full-performance attack on Wi-Fi passwords. Running on multiple computers, Elcomsoft Distributed Password Recovery can utilize all available resources (CPU and GPU units) when attempting to break your wireless password. If your password cannot be recovered after a reasonably long distributed attack, you may assume your network if sufficiently secure. 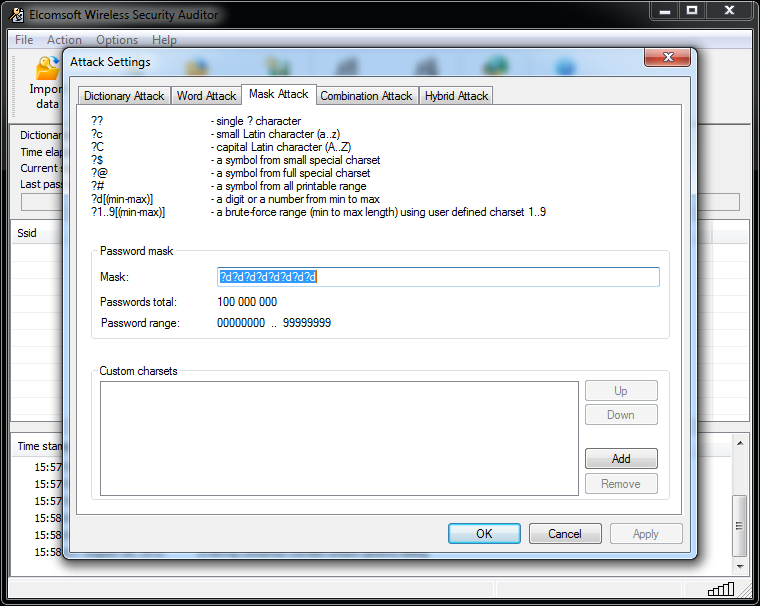 Elcomsoft Wireless Security Auditor performs a range of highly configurable attacks targeting the human factor. Advanced dictionary attacks are combined with common mutations in order to expose weak passwords consisting of words and phrases in spoken languages. Allowing highly customizable mutations of ordinary dictionary words, Elcomsoft Wireless Security Auditor performs hundreds of mutations to each word in order to ensure the widest coverage. Elcomsoft Wireless Security Auditor supports highly customizable mutations that target the majority of use cases. Mutations include digits and special caracters, "hacker talk" and years, case and character substitutions, and many others. The tool can combine words from multiple dictionaries, and includes the widest range of manual settings, tweaks and rules such as regular expressions to ensure that most non-random passwords can be recovered in a reasonable time. The Standard Edition supports up to 2 CPU cores and just 1 GPU. The Professional Edition does not artificially limit the number of CPU and GPU cores in use. The Professional edition adds support for Tableau TACC1441 hardware accelerators and includes wireless sniffing capabilities with AirPCap adapters and many types of general-use Wi-Fi adapters. The trial version supports up to 2 CPU cores and 1 GPU. Neither wireless sniffing nor Tableau TACC1441 are supported in the trial version. A 15 second demo is played during startup. The trial version only displays the first 2 characters of the Wi-Fi password.